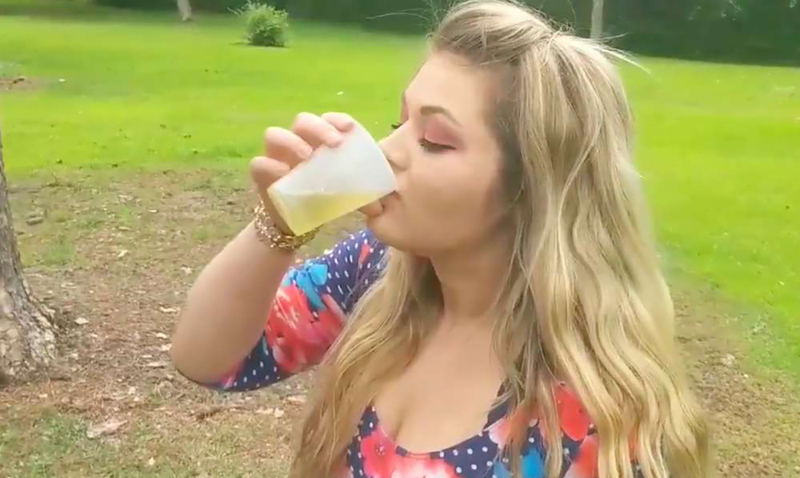 There has recently been a video going viral that shows a woman drinking her dog’s fresh urine as if that didn’t call for alarm enough she is also claiming it has helped her clear up her acne. Yes, we are all as shocked as you are. The woman in this video is shown holding a cup under her dog as he is mid piss from there she downs it quickly. This video is almost two minutes long and has tons of views. The girl in the video’s name is Lynn Lew and she claims that the power of dog urine is something the medical world doesn’t want us to know about. She says she has been drinking dog urine for a while now and that it can even help cure cancer. She claims it gives her a natural glow and has somehow worked wonders in her life. While we do not know for sure if the video is some kind of troll post and somehow she was drinking some kind of fake dog urine but it sure does look pretty convincing. That being said, just in case anyone was considering it DO NOT DRINK DOG URINE. Don’t drink urine at all period for that matter. Take a look at the mess that is this video below. Sure, urine therapy has been around for hundreds of years but there are plenty of other options out there. I would much rather drink lemon juice for gastric upset than piss. There are no health benefits to drinking dog pee and it damn sure can’t taste good. In human pee alone there are over 3,000 chemicals most of which are made by bacteria. Dog urine is made up of ammonia, hormones, and bacteria. It is NOT something anyone should be ingesting. While we hope the video was made to be a joke it is not a very good one regardless. What do you think? Could Lynn Lew be the Monster Troll of 2018 or might she be delusional?